The first frame sets half of the stage: Our protagonist, Dad, is a middle-aged man sitting at his kitchen table, working on a crossword as he finishes his breakfast. He’s pleasantly surprised by the sound of his wife laughing, and he looks up and smiles. In the background, we see a figure standing with a lawnmower, although specifics are unclear. The camera angle changes to reveal the rest of the set: We’re now behind him, looking at the body of the kitchen. His wife, Mom, stands at the sink, facing away and talking on the phone as she says “Oh my god! You can’t do that.” The kitchen is pristine, and we can see deeper into the house on the far right of the frame, where the tasteful stylings of the kitchen extend to reveal an upper-middle-class existence. The camera, matching Dad’s attention, pans to reveal the Son, framed in the previously empty doorframe. He’s dirty and bloodied. Over the shoulder of the Son, Dad is shocked. “Bobby!” he exclaims while rising from his seat, “What happened?” The Son puts his hand up to halt Dad’s movement, as the sound of Mom’s phone conversation resonates through the room: “You can’t! You’ll get fired,” drawing out her final word with a sultry vocal fry in her voice. Dad turns to look at her, confused by her tone but more concerned with his son. We look down on Dad from a near-God’s eye view as the Lynchian drone transitions to a mosquito-like buzz and the sound of the lawnmower becomes overpowering. Text overlays across Dad’s face: “This Man Isn’t You. Don’t Let Him Be.” Finally, the UNITRONIC logo and slogan (“DELIVER THE POWER”) slam onto the screen to replace the other text as the cacophony of buzzing drones and the lawnmower resolve in a cathartic thunder crash. The scene cuts to black. This advertisement, however absurd in its presentation, is rich in complexity and symbolic detail. First, Dad’s existence and characterization require deconstruction: He’s reasonably wealthy and enjoys a seemingly idyllic American lifestyle, completing a crossword and enjoying a relaxed morning meal with his wife while his son plays and a subordinate mows his lawn. He’s presented as idiotically happy, ignorant to the material of his wife’s phone conversation and the identity of her conversation partner (who literally resides in his backyard). The wife’s and son’s identities demand similar treatment: Mom, at the window, is carefree and eager, enjoying both her view of the outside world and her digital, depersonalized interaction via her phone. Son, at first missing from the scene, is marked by his comatose fixation on the speed of his dad’s car. His injuries are pure decoration; beyond Mom’s brief and unaddressed inquiry, he’s unaffected by his appearance and seems indifferent to his apparent pain. When Son enters the room, Dad’s attention is captured by his son’s injuries but only briefly, as it quickly shifts to Son’s line of questioning. First, he defends himself (“What? That’s ridiculous. The other kids’ fathers do not have faster cars.”) but he quickly abandons this strategy and instead concedes, asking for identification of his accusers (“Who says?”). The sudden transition to the God’s eye view indicates the messenger behind the text overlays: God’s judgement is revealed with “This Man Isn’t You. 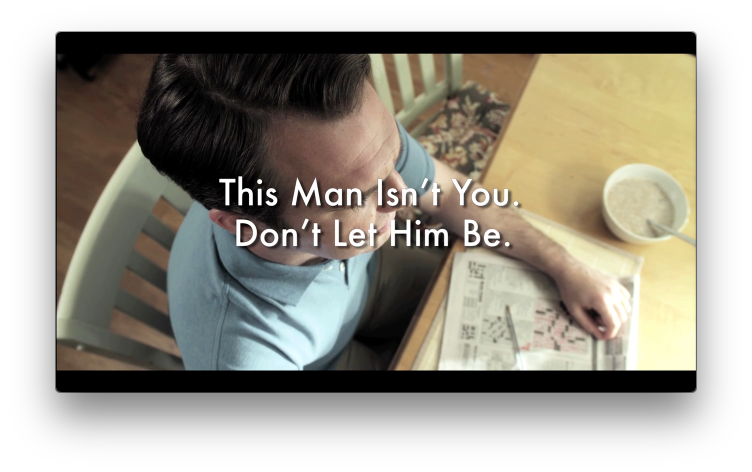 Don’t Let Him Be.” This message begs a question (how can we avoid being this man?) but the answer arrives immediately in the form of the second set of text. The sound of thunder brings relief to the now-overwhelming sound design, ending the nightmare and hailing the arrival of Dad’s savior, UNITRONIC (a company that provides car tuning technology). With UNITRONIC, Dad’s car might be faster than the other kids’ dads, and his problems will be solved. For now, he's not DELIVER[ING] THE POWER despite his capability; instead, he blithely idles while his home metaphorically burns around him. Aster is a natural with set and sound design, as well as framing and blocking. Everything in this ad (one of his earliest publicly shared projects) is pure intent, and Aster makes realizing an artistic vision look easy (which is partly why I’m incredibly excited for his upcoming Hereditary, another movie that looks to examine an extremely unhappy family). Dad’s role in the advertisement is easiest to identify – we’re in his upper-middle-class house, he’s relaxing and enjoying himself while his wife ignores him in the kitchen and engages in indiscretions with his gardener: He is old America, characterized by the hallmarks (both positive and negative) of pre-digital generations. Mom’s dialogue and body language clarify her symbolic identity: She’s the unsatisfied masses, in the same economic cohort as Dad but preferring to be ‘outside’ (staring out the window, on the phone with her secret, more attractive lover). Her language (“Oh my god! You can’t do that. You can’t! You’ll get fired.”) indicates the content of her conversation as explicit and pertaining to her husband’s status as the gardener’s employer. The gardener is also of interest here; if he represents ‘outside,’ perhaps he also represents the culture ‘outside’ Dad’s existence – lower economic class, muscular and attractive from a life of menial labor. His role as secret lover to Mom is undiscovered or ignored, just as the problematic relationship between wealthy Americans and Americans of lower economic standing goes continually unaddressed despite worsening disparity. Similarly, Mom might like the idea of being outside with the gardener, but she'd be far less happy to mow the lawn herself, again revealing a crucial disconnect between fantasizing about living a different life and actually living it. The Son’s role is most tragic. He’s clearly been beaten – whether by other kids, an adult (the gardener? That would certainly get him fired), or accidentally doesn’t matter – but his attention is fixated on the speed of Dad’s car, which mirrors Dad’s own fixation. Ignoring both his wife’s obviously inappropriate conversation (his perturbed glance immediately transforms in response to his son’s line of questioning) and his son’s injuries, Dad never addresses these issues, instead focusing on the issue of the car. When his wife confirms his son’s accusation, the tone of the commercial informs us that this situation is Dad’s nightmare: not his wife dreaming of leaving him, not his son facing bodily harm, but the perception of driving a slow car.